Good evening! Well, what do you know? I sat down to do a card for a challenge today, and I actually finished it without getting distracted by something shiny. In fact, I did two cards for this challenge (I’ll show you the other one on another day). 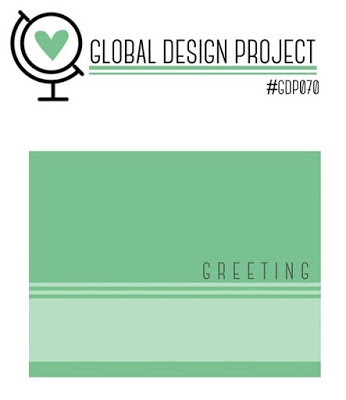 I loved this sketch from the Global Design Project challenge! It lends itself to clean-and-simple cards, fancy cards, and in this case, a shaker card. I love shakers! Unexpected fun for your recipient. *The card base is Mint Macaron, 11″x4.25″ (scored at 5.5″). It opens book-wise, but you can do the fold across the top, too. I keep a box of pre-cut and -scored card bases on my desk, and this was the only Mint Macaron one I had (and I may or may not be placing an emergency order, because I’M ALL OUT OF MINT MACARON CARDSTOCK). *The Melon Mambo and Basic Black cardstock are 5.5″x2.5″, and I cut the Window Sheet the same size. I used my Stampin’ Trimmer to cut the middle out of the Melon Mambo piece. The trimmer is made so well for making precise cuts — there are rulers and grid lines all over the thing. I left a 1/4″ border all the way around. *I laid out the card to see where the balloons would go before I heat embossed the strings on the black piece. I started with the string on the right, then did the one on the left (I laid the balloons out a second time before I embossed the left string to make sure I remembered correctly — you could also mark it in pencil then erase later). 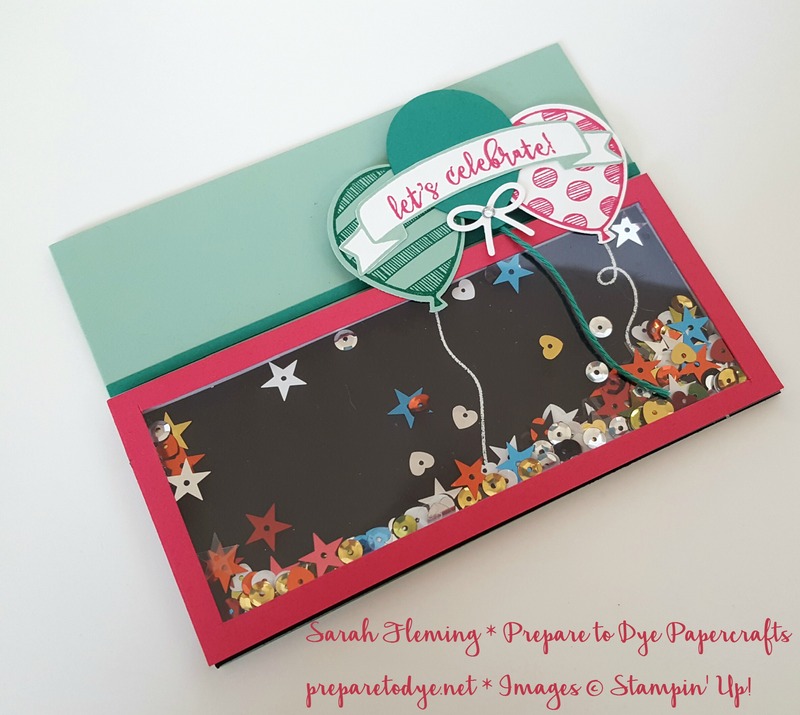 *After embossing the strings and gluing the Basic Black piece down, place a heap of sequins or glitter or paper confetti in the center of the rectangle, remove the backing from the foam strips, and place the window rectangle on top of the Basic Black rectangle. 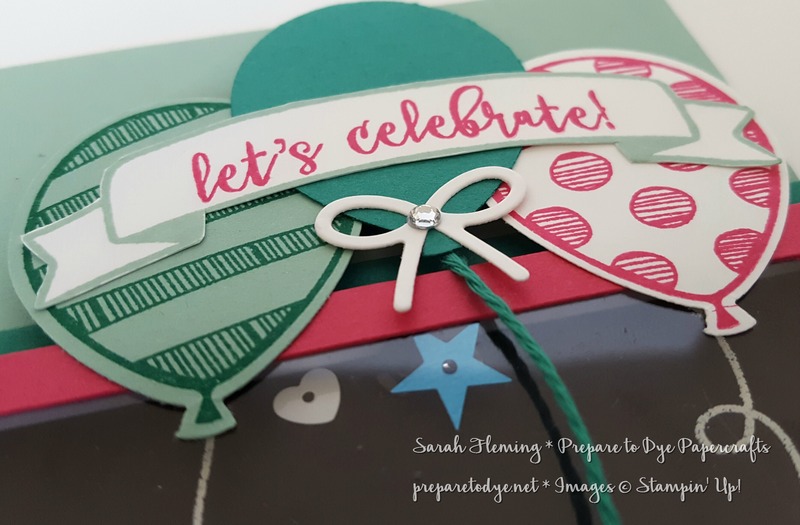 *The teeny Emerald Envy strip is 5.5″x 1/8″. Glue that down before you attach the balloons. *Since you don’t want the balloons to look sad and floppy, pop those up on the same Foam Strips rather than regular Dimensionals so you have the same height. The foam goes under the part of the balloon that is *not* over the shaker frame. Just put some glue on the part that goes over the shaker frame. *The banner is fussy-cut, the balloons are punched, and the bow is die-cut. 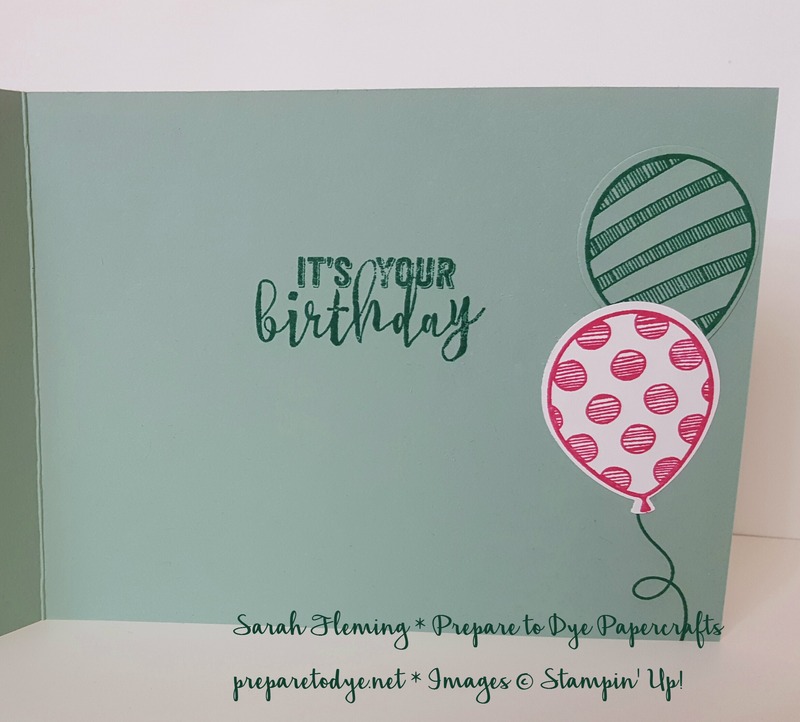 *Don’t forget to finish the inside of your card to match! A full supply list is below. I hope you like my card. 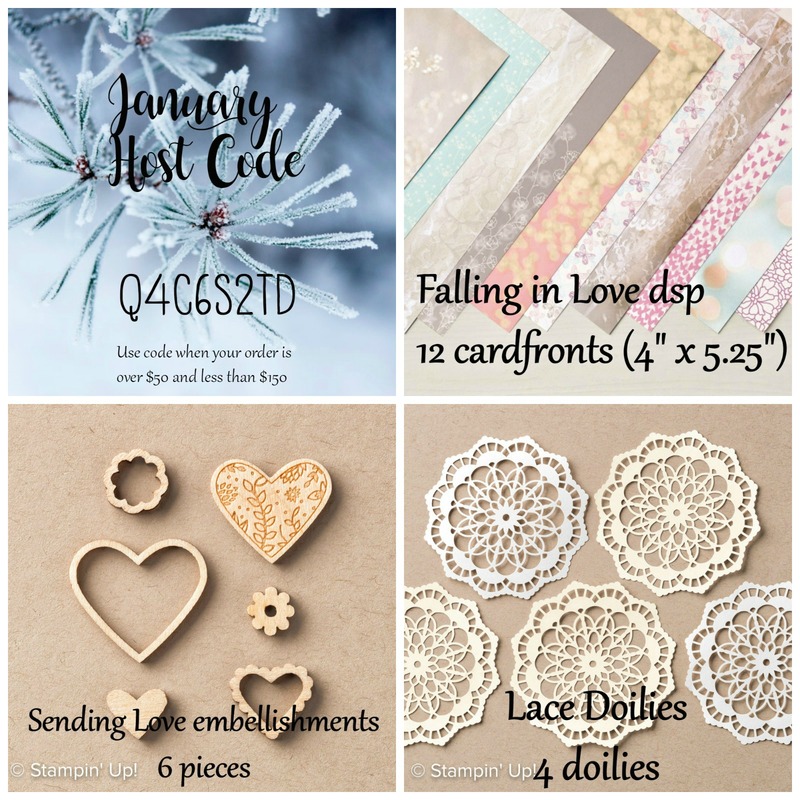 Check back tomorrow for more new Occasions and Sale-A-Bration projects!